For some time now photographers have been waiting in hope for the application that would help them track use of their images. Something that, without prohibitive amounts of effort and financial investment would allow them to find illicit uses so they could chase infringers for payment and to have the work removed from websites where it’s not licensed to be used. Of course photographers are keen to ensure they get paid for infringements, and this is the side of the copyright argument that is so often flagged up by those who would like to be allowed to infringe more freely (sometimes known as freetards). Having photographers portrayed as money-grabbing monopolists is a handy way of demonizing those who merely want to protect the work they create. What gets mentioned less is the harm it does to a photographer when work they have shot and charged to a commissioning client gets hijacked by someone who is just not in the mood for paying for the stuff they use. If an image is licensed to a paying client, and they see someone else using it for free, it can harm the photographer/client relationship and also cause problems with exclusivity, model releases and further legal issues where a stolen image is being used in a libelous context. All these are issues faced by the photographer today, and it can take a lot of valuable time just to ensure images are not being appropriated by inappropriate people and used in inappropriate ways (that’s easy for me to say). So while the tineye service has been around a while, and it can be very good at “reverse image searches” it’s also clear it can’t possibly keep up with indexing every image that gets uploaded to a website every minute of the day. Better perhaps if a service like Google, which seems to have web crawling and indexing off to a fine art, could come up with something more powerful. Cue Google image search, where you chuck an image from your hard drive into the search box on Google which then returns matches of that image, plus any similar images it finds. However, if photographers thought Google had the answer, they may be disappointed to discover that Google’s image search function was starting out with a different question. 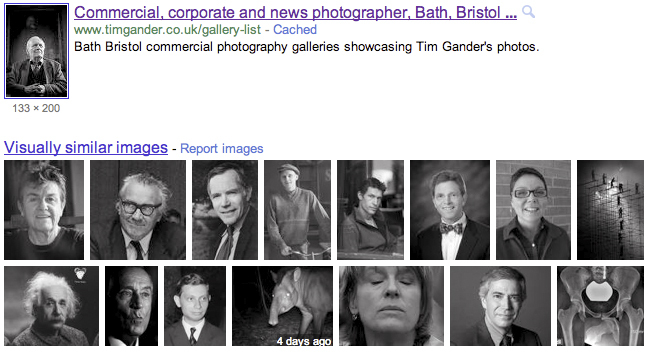 I’ve been playing with Google’s image search function, and to me it’s more suited to finding images which represent the feel or look of an image you already have, but which might not quite match what you’re after, rather than a tool for photographers to use to find infringing copies of their images. Having run a few of my images through the system, I found some bizarre and vaguely humourous results, which I’ve set out below. Try it with some of your own images, and see what happens. I’m sure there’s a great game waiting to be invented. Starting with Yours Truly: None of these women looks like me, but one appears to be holding a camera. Seriously?! : Tony Benn is, among other things, matched with Einstein, a tapir and an X-ray of a pelvis. Squint and some of them do look similar. I’m going to start by apologising that this week’s posting is late, and that it’s a bit lightweight, but I only got back from a trip away (see below) late last night and have been playing catch-up with work all day. There’s a certain inevitability that a photographer on holiday still takes pictures, but for me it’s a struggle to take landscapes and holiday snaps that really please me, so when I went up country to visit my brother in County Durham last week, what was the photo I got the biggest kick out of? A bowl of fruit of course. Obvious, innit? The only camera I took for myself was a Canon G11, and a Yashica T3 Super film camera for my son. We don’t have the photos from that yet, but I wouldn’t mind betting they’ll be pretty good. That camera always had a brilliant lens on it, and my son can spot a decent photo sometimes. In addition to the G11 I took an ancient Vivitar 283 flash with the thyristor connecting cable, which allowed me to use off-camera flash with the G11. I know I’m getting more technical than usual here, but some of you will be intrigued I’m sure. 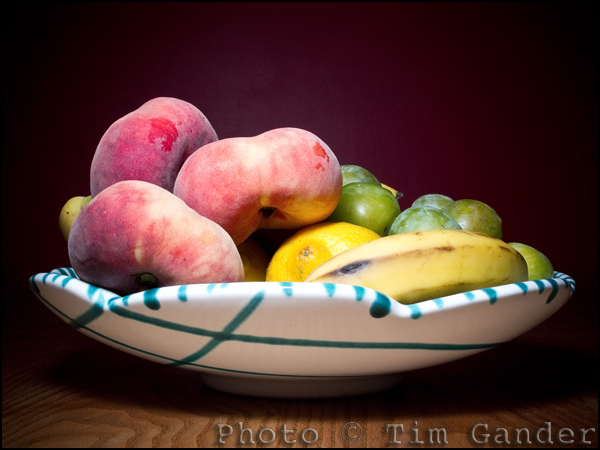 And it’s with this simple set-up I shot the bowl of fruit one rainy afternoon when there was nothing better to do. You might think that being a photographer I’d have taken some big flashy camera with me, but we were flying and I didn’t want to lug it about. The G11 is a good camera for what it is (a compact), but I’m convinced it’ll do some kinds of pictures brilliantly, while others are a lot more work. For example, landscapes. It might well be me, but I can’t seem to get a decent landscape out of it. I’ll freely admit I’m not much cop at doing the kind of landscape shot that makes you gasp, but there’s something about the detail in nature which seems to baffle the G11. It’s the grass and the leaves on the trees that just seem to turn into a big greenish blotch. As for pictures of my son as he runs about, the G11 suffers from the shutter lag that still hobbles a lot of compact cameras. So here it is, a still-life that reminds me of the holiday without being a typical holiday snap. I hope you enjoy it. Still life of a Durham fruit bowl. Don’t be the bird that swallows the plate. Why is this relevant to anything I have to say about photography? Well it’s simple really, dear reader; When a business plans its photography in small, manageable chunks throughout the year it can cope with getting what it needs without too much drama, but leave it for a year, two years, five years, and the project becomes rather like a bird swallowing a plate. Trying to ingest the ingestible, and risking some kind of injury in the process. I’ve said before that photography should be treated as part of the over-all marketing plan, not as part of the web budget, because photos can be used in print as well as web. Try printing a website as a brochure, and you’ll start to understand what I mean – they’re separate budgets within the over all marketing budget. By keeping your photography fresh and up-to-date you might very well spend a little more over time, but at least you won’t have a colossal expenditure to make in one go if you’re trying to start from scratch, having neglected the photography for some years. And since business people like to say “cash is king,” doesn’t it make sense to make smaller investments that add up to a solid image library than to trying to buy your entire photo library in one huge gulp? So keep headshots up to date regularly, don’t wait until there’s a week’s worth to be shot unless you’re prepared for the cost. Keep on top of product, site, process and PR images. Consider planning a shoot every three months (or whatever suits best, so long as it’s regular). Or at the very least, review what you have and what you need on a quarterly basis. 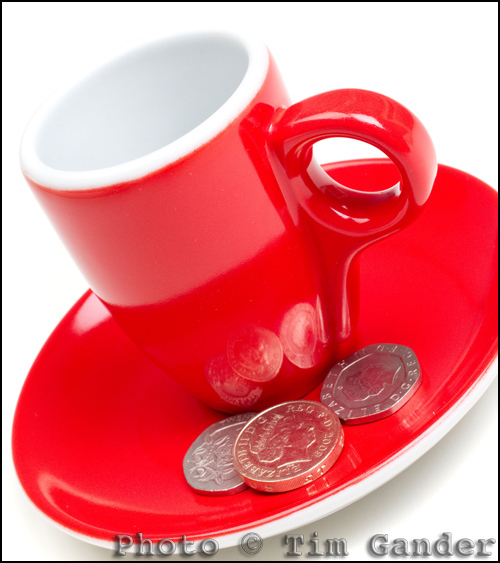 You’re buying the coffee, not the cafe. Buy in stages and don’t insist on all copyright. To extend the subject a little, think more carefully about the image rights you need. Consider restricting your requirements to (for example) a three-year time limit. Certainly avoid all-rights or full copyright buyouts as it’s extremely rare for a business to actually require these rights, and most sensible photographers will charge more if you demand full copyright because they’ll assume you wish to allow other businesses use of your images, when the photographer might reasonably expect to be able to re-licence the images to those third-parties (with your permission, of course). Certainly it’s normal for editorial images to be bought on licences that are limited by print run, territory/language and duration of use. 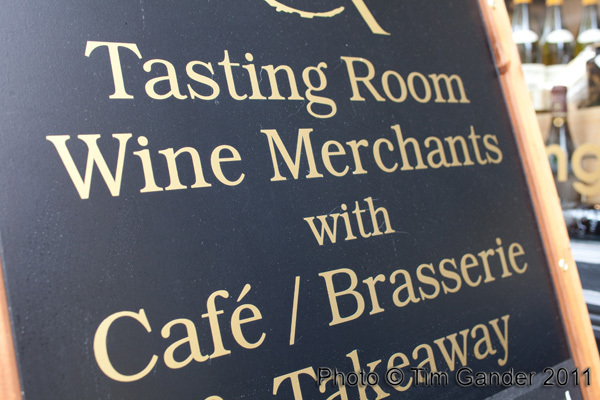 Commercial images tend to be sold on wider licences, but limits can help in the negotiation process and you can always top-up the licence later. If you have any questions about anything I’ve said here, or have a favourite Black Adder scene, feel free to comment below. If I spent too much time listening to business people and their opinions on the importance (or lack) of photography to their success, I’d probably jack it all in and go into a career with higher public opinion ratings. Perhaps become an estate agent or politician. Maybe a tabloid journalist. Luckily, I don’t worry about the businesses that don’t understand how essential good imagery is because that way lies madness. Instead I concentrate on helping those who understand the difference, and who can see what good imagery can do for their chances of success. 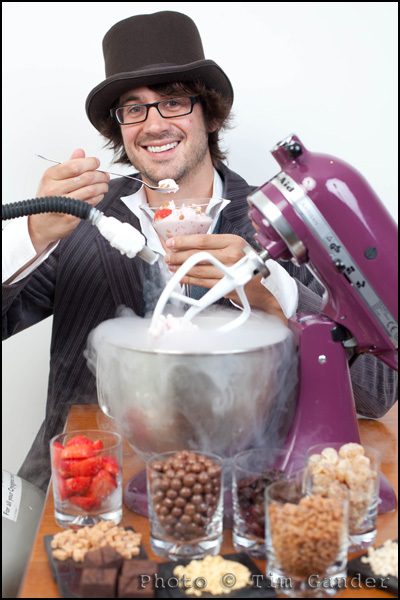 One such example is entrepreneurial maker of ice cream, Charlie Francis of Lick Me I’m Delicious in Bristol. Now Charlie didn’t choose me. He wasn’t the one setting up the shoot, which came about as part of Barclays’ Take One Small Step competition which was set up to offer a £50,000 prize to entrepreneurs in different regions of the UK, but I’m glad I got to do the shoot because it turns out Charlie actually understands that image is vital to business. For him, it was critical to his competition chances because to win he had to garner more votes than the other contestants within his region. Before I visited to do the shoot, Charlie and I spoke on the phone about what would and would not work, and he immediately struck me as someone who understood the fun element of his product and was willing to be very much the “personality” of his business. 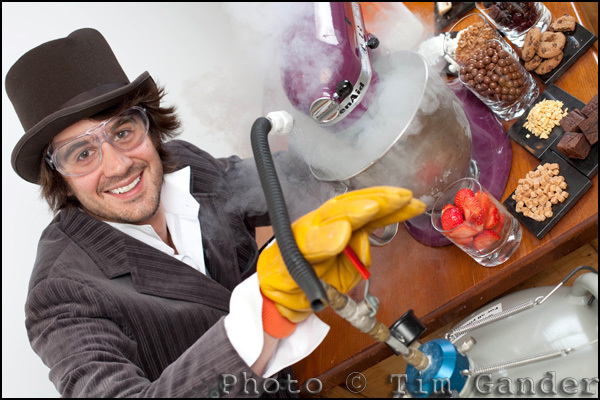 It was Charlie’s idea to have a sort of Willie Wonka persona for the shoot, and I think it worked brilliantly, especially given that his ice cream is made before your very eyes using your favourite ingredients and using liquid nitrogen! Use your personality to win over clients. The pictures done and delivered to the PR agency, the competition got under way and Charlie started working hard to get his votes in. The press release went all over the region, and an unusually high number of publications included the photo – precisely because it was fun, colourful, and shot to a newspaper style. Then last week, Charlie discovered he had won the £50,000 prize for the South West region! Now I’m not going to say this was ALL down to the pictures. I know Charlie worked hard to get the word out and drum up support for his entry, and who doesn’t like ice cream? But the pictures were clearly eye-catching and formed an important part of the vote-winning exercise. A choice of upright and landscape shots helps get extra press coverage.